Maintenance personnel often come across the metrological terms calibration and verification. For some, these two concepts are known and easy to differentiate, for others, they can cause confusion. An interpretation of verification consists of checking calibration results as ‘objective evidence’ to comply with a ‘specified requirement’, such as the Maximum Permissible Error (MPE), defined either by a manufacturer, a legal metrology organisation or an end-user (i.e. process application). 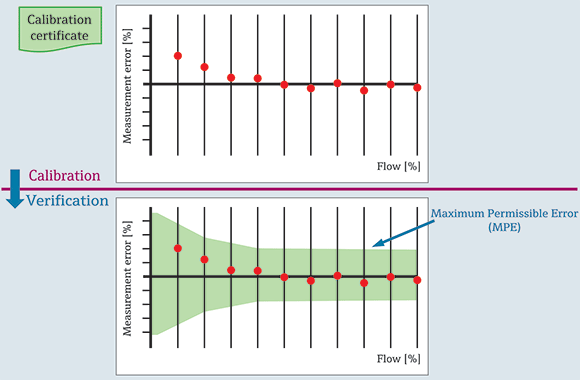 This situation is illustrated in Figure 1, where the device’s relative measurement errors obtained by the calibration rig turn out to be smaller than the MPE, meaning that the flowmeter (item) fulfils the specified requirement. Figure 1: A verification task based on a flowmeter’s Maximum Permissible Error (MPE). • Heartbeat Technology verifies the correct function of the measuring device according to the specifications and generates a protocol without process interruption. • The automatic generated protocol supports the documentation requested by internal and external formalities, laws and standards. • The inline verification is a comparison of the results obtained from the unit under test (UUT) against the inline ultrasonic clamp-on flowmeter. • A verification certificate which indicates the measured error between both the measurements is generated. • The requirements of industry regulators and standards like FDA, IFS, ISO 9000 etc. • To prevent influence of inaccurate measurements on the quality of the final product. • To prevent energy or material losses due to improper control. 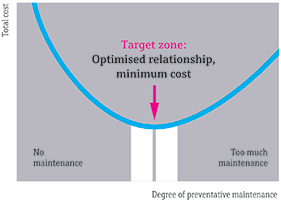 • To prevent safety issues caused by poor monitoring. On-site calibration is performed by highly trained engineers. It is convenient and cost effective, and removes the need to send instruments offsite, keeping downtime to an absolute minimum. It also offers the highest flexibility as calibration can be scheduled according to process demands. Laboratory calibration services are one-time or repeat contract-based calibrations of customer instrumentation carried out in a facility owned by Endress+Hauser. Calibration services performed in a laboratory have the advantages of the best calibration uncertainty and wide calibration ranges. Calibration management service is an optimisation service where Endress+Hauser take day-to-day management responsibility of a customer’s calibration function. Goals of this outsourcing are improving a customer’s plant operations, and securing calibration process compliance to internal and external regulations while reducing its costs.